Unlike its name suggests – it is a flat floored room. 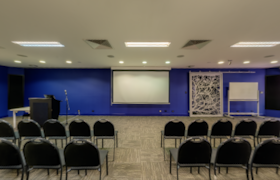 The Theatre is a large and flexible room, easily adapted to accommodate large numbers in a variety of function styles. Rounds, classroom, U Shape or theatre style chairs. 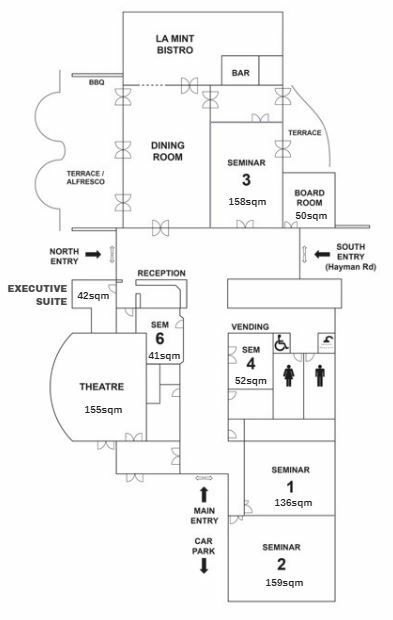 The Theatre also has an attached ante-room which is perfect for catered functions, storage of equipment or for pre and post function socialising. High quality audio visual equipment. A large, almost square function space. It has accordion doors making it easily opened to combine with Seminar 2 for larger functions. Ceiling to floor windows down one side. Large pin boards the other makes this location an ideal choice within the lush tree lined Technology Park surrounds. Quality audio and visual equipment. Seminar Room 1 and Seminar Room 2 open up into one large, multi functional space. There are many ways to set the room up to gain the most out of your event with us and to ensure all guests have the best possible view. Natural light from both sides of the room allow for great views across the green park. 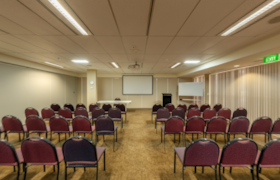 Multiple ceiling mounted data projector and large screens – flexible setup. Set down a quiet end of the centre, Seminar 2 offers two side walls with floor to ceiling windows. 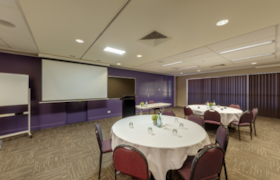 If natural light is your preference when training , then look no further than this function room. Seminar 2 combines with Seminar 1 to accommodate larger functions. It also features ceiling to floor windows to provide both views of Technology Park gardens and allow in abundant natural lighting. 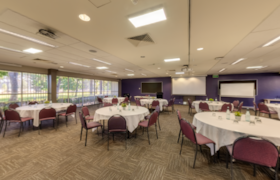 One of four larger spaces within the centre – Seminar Room 3 is a long rectangular area. It has the option to be combined with the dining room for celebrations and other large catered functions. This room has an adjoining courtyard for outdoor entertaining and catering, or as an outdoor break-out area. 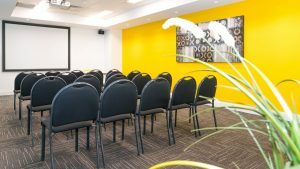 One of our more intimate spaces, Seminar Room 4 is perfect for medium to small events. Featuring a bulk head style ceiling with warm down lights. It has a ceiling mounted projector and inbuilt Bose speakers. 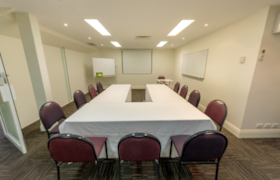 Video and telephone conference facilities. 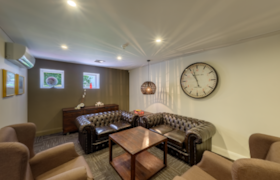 Recently refurbished to an ambient high-end finish, the Executive Suite offers meeting luxury for small groups at an affordable price. Perfect for up to 2-6 people. Custom designed for interviews, small private meetings and important meeting dial ins that require absolute privacy. This is a small meeting and training area. Ideally suited for up to 10 people, it is perfect for small training sessions or used for breakout sessions away from the main plenary. Recessed area perfect for catering or a resource table. This is an executive boardroom. 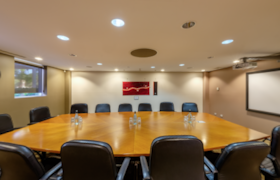 The Boardroom is fully equipped with the latest in audio visual equipment including ceiling mounted data projector and inbuilt sound system. 16 luxurious leather seats around a large central boardroom table. Multiple internet and data connection points. Flip top table power connection. Wireless high-speed fibre optic internet. 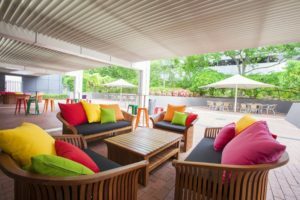 The Terrace is a relaxing entertaining area, which can be used for outdoor events including sundowners, corporate barbeques or cocktail events. The terrace features an inbuilt barbeque against an attractive feature wall. The Gala Room is a combination of the Terrace, Dining Area and Seminar 3. 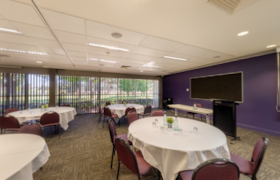 This large and flexible space is perfect for cocktail functions, celebrations, trade shows and graduations. 55 inch LCD Samsung Smart TV.